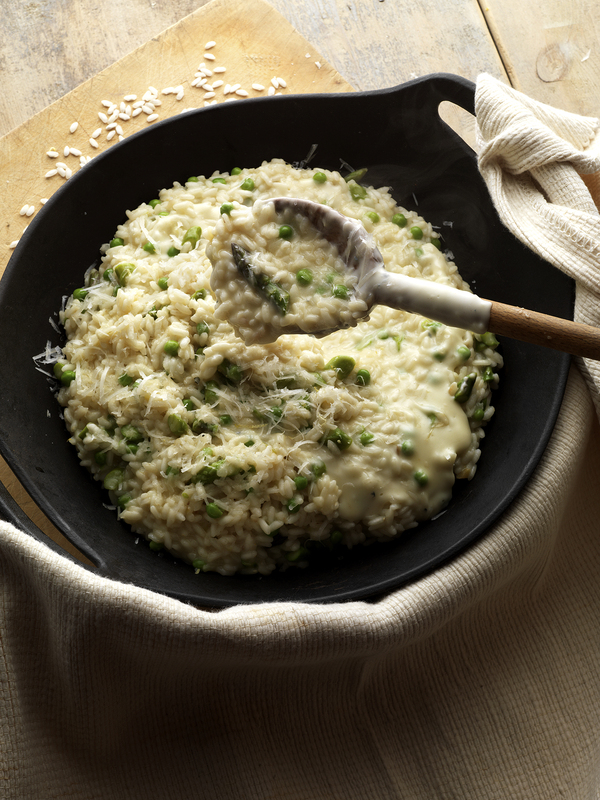 Made in the late spring or early summer this risotto brings out the best of some truly wonderful seasonal ingredients, home grown asparagus and tender sweet peas. I use a medley of 4 creamy Italian cheeses for this dish, but feel free to experiment and choose your own favourites. As the asparagus is tender at this time of year, there is no need to peel it. Place the stock in a pan, bring it to the boil, reduce the heat to a simmer, and keep it hot. Cut the asparagus in 3 cm lengths. Heat the olive oil and butter in a heavy based pan, add the onion and garlic, and cook until softened. Add the rice, mix well with the onions and cook for 2 minutes until the rice is well coated. Add the wine and cook for one minute to evaporate it and completely absorbed. Add a ladle of hot stock and simmer , stirring constantly, until all has been absorbed. Add the asparagus and peas and mix well. Continue to add the stock a ladle at a time until all is absorbed. After 18-20 minutes check for the required "al dente" texture…the rice should be tender, but with a firm bite in the centre. Cover the risotto with a lid and leave to stand for 2 minutes. For the fonduta… heat the milk, cornflour and cream in a pan to the boil. Add the tallegio, fontina and gorgonzola cheeses and 50g of the parmesan, stir into the cream to melt it, stir until whole mix is smooth and creamy. Divide the risotto between 4 serving plates, spoon some of the fonduta over each risotto, sprinkle over the remaining parmesan and serve.